Protestors gather at Old Town Hall Green to call for the full release of special counsel Robert Mueller's report. FAIRFIELD — Nearly a week and a half after Attorney General William Barr sent Congress his four-page summary of special counsel’s Robert Mueller report, protests were coordinated nationwide April 4, calling for the release of the entire report. Fairfield residents and activist groups weren’t going to be left out. Over 60 people gathered at Fairfield’s Town Hall Green from 5 to 6:30 p.m., according to Fairfield resident and the event’s organizer Sharon Pistilli. “The bottom line is that people are learning that each one of us is a citizen of the U.S. and we have a responsibility to our democracy,” Pistilli, an RTM member of District 3 and a leader of Fairfield Standing United, said. “Do not Barr the Mueller report, release it now!” one of the several signs read at the April 4 event in Fairfield. The nationwide event was organized via MoveOn, a liberal group, with the hashtag to #ReleaseTheReport. 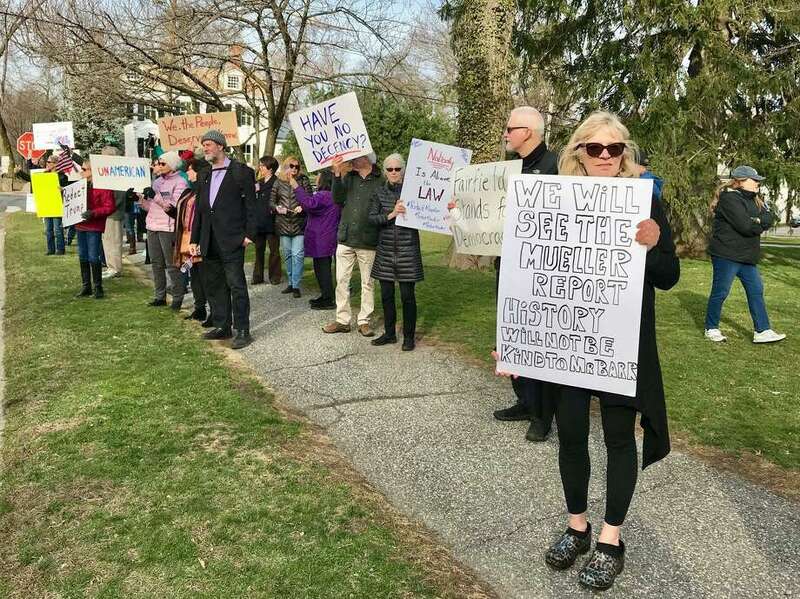 Protestors rallied in the hundreds and in the thousands in cities like Boston, Houston, Los Angeles and D.C.
Protestors also gathered in neighboring Norwalk in favor of the release of the Mueller report. Counterprotestors also showed up, incuding some who drove back and forth with a #MAGA sign on their truck and signs decrying CNN as fake news, a now typical chant at Trump rallies. The famed Mueller report, which was concluded in late March, has yet to be fully released. Barr’s summary noted President Donald Trump’s campaign did not coordinate with Russia and no conclusion was reached on whether Trump obstructed justice. Steve Sheinberg, chairman of the Fairfield Democratic Town Convention, called the four-page summary issued by Barr a “whitewash” and also supported for the release of the Mueller report. For the event, Pistilli dressed up as Lady Liberty.